- The Baroque Music Festival of the Holy Week will be from April 15 to 19, 2019. Highly recommended to experience in the ideal environment of the House of Liberty in Sucre. - To know the traditional events of Sucre, we can already anticipate that there will be the Chocolate Festival around the Departmental Anniversary of May 25, and the Folkloric Parade of the Virgin of Guadalupe in the month of September. Exact dates will be confirmed soon. 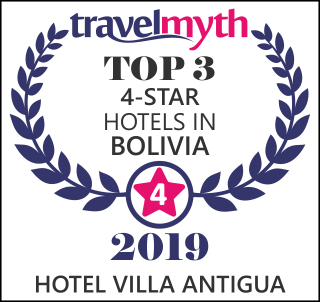 Villa Antigua is a 4 star boutique hotel part of the Historic Center of Sucre, Bolivia. It is located in a manor house, which has been renovated, reflecting and working carefully for you to enjoy, with the comfort of accommodation that complements your trip of tourism, work or family visit. The hotel has wide public spaces that include a garden, terraces and a patio, which transmit a great tranquility as well as having spectacular views of the old town and the mountains. The elegant architecture reflects the colonial history of Bolivia and, in particular, of Sucre, one of the oldest cities in South America and also the place where the First Libertarian Cry of the Continent was launched, which gave birth to the process of independence. It is a World Heritage Site by UNESCO, highlighting the encounter between indigenous and colonial European cultures, very authentic and visible in today's daily life. The building tells its own story in the book 'PASEO HISTORICO POR SUCRE desde la casa del Hotel Villa Antigua' (HISTORICAL WALK THROUGH SUCRE from the house of Hotel Villa Antigua), with the particularities of the owners and of Sucre from the 16th century to the present day. Do not forget to look at the promotions we have for your benefit. Why choose Hotel Villa Antigua?